This is a guest post by David C Moore and is an extract from his new book ‘Turning Left Around the World’. It is an entertaining account of their adventure, often intriguing, frequently funny and occasionally tragic. Their journey was to include the Atacama Desert, Galapagos Islands, Easter Island, Machu Picchu, Ayres Rock and the Great Wall of China. Share their adventure, enjoy the surprises and meet some fascinating people along the way. The book is published by Mirador and available now on Amazon. Here we join them on their hike of the Nakasendo Trail in Japan. The Nakasendo Highway or “Road through the Central Mountains” was part of feudal Japan’s network of highways and first established in the 8th C. linking the areas around the then capital Nara as the state grew. 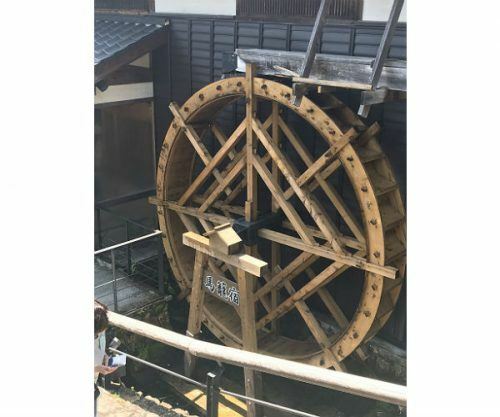 It continued to develop until the Edo period when the centre of power moved to what is now Tokyo and it became a communications route to send messages, goods and personnel across the empire between Kyoto and Tokyo. Trodden by feudal lords, samurai, merchants and ancient travellers it was our turn to follow in their footsteps on this most beautiful of trials. Its full length is an impressive 531 km weaving between mountain ranges, on paved and cobbled paths. 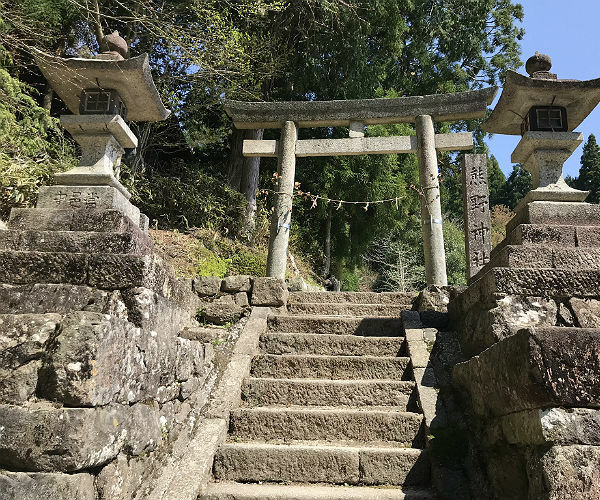 69 Villages along its route were selected as juku Post Towns to provide food and lodgings for official travellers, our hike was from one of these, Magome to the most beautiful of them all, Tsumago the finest traditional Post Town in Japan. The trail begins/ends in Tokyo and Kyoto. There are many choices as to how to walk the Nakasendo trail. Of course, you could do the whole thing which is done by many. Or choose to take just one stretch of it. 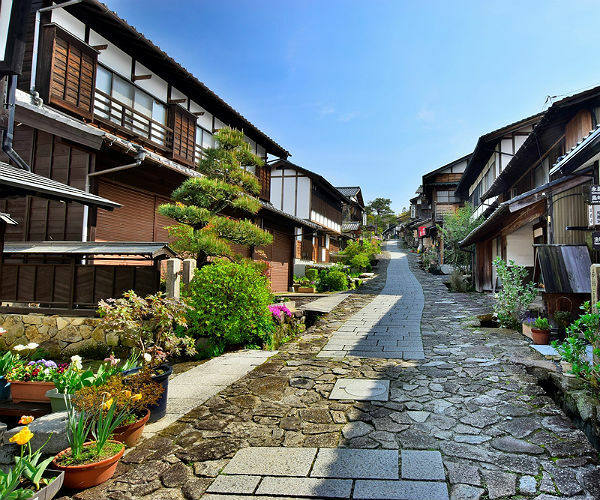 This article covers the very scenic and popular portion between Magome and Tsumago. 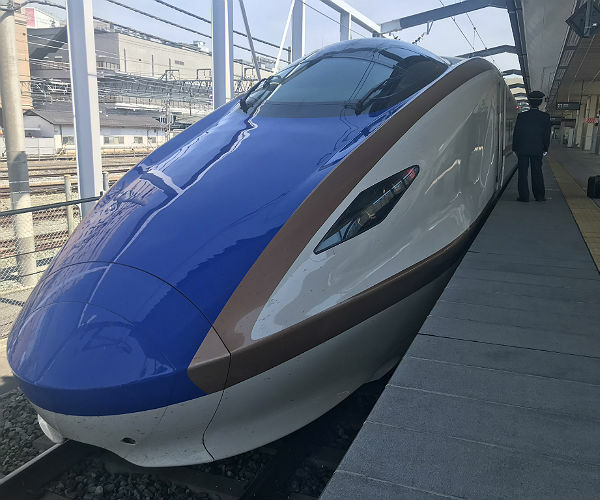 Our luggage was forwarded on to our next city hotel with typical Japanese efficiency allowing us to take the wonderful bullet train and far slower local trains to Magome for a highlight of our Japan leg; a hike on the Nakasendo Trail. But not before we had our first sight of the magnificent Mount Fuji as we hurtled out of suburbia into lush rolling hills and picturesque valleys. 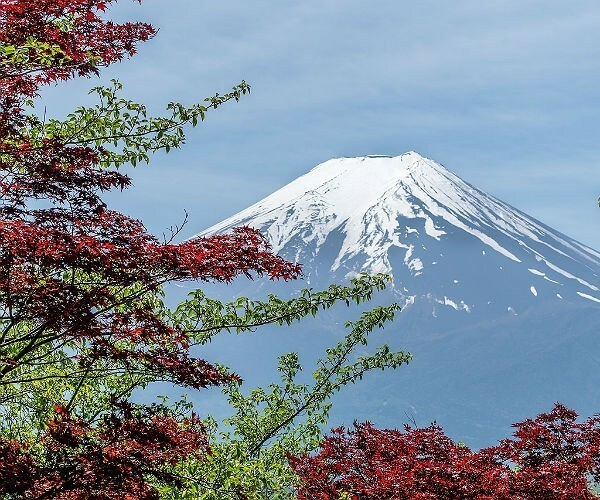 Like every National Geographic image we have seen of Fuji it stood majestically in isolation, dominating the landscape with its summit in snow as if the peak had been dipped in a bucket of melted vanilla ice cream. It was a crisp clear day without a cloud in the blue sky, my goodness it was a wonderful sight. But Mount Fuji had to wait, first was a hike on the most famous trail in Japan. We were just setting off to tackle our small part of the route when we met two elderly ladies a little red faced and puffing a bit, coming in the opposite direction. ‘Are you just setting off?’ one of them asked, in a broad North Country accent. ‘Yes, how long has it taken you?’ she asked. ‘Four days so far,’ replied the elderly lady. The couple went on to explain they were hiking half of the whole Highway, although we had heard it takes up to 12 days to hike the whole trail. We felt a little too ashamed to admit we were tackling only a few miles, so wished them luck and set off up the narrow cobbled path on a beautiful warm and clear day. In 1968 the Tsumago locals banded together to create a movement and protect the heritage of their town. 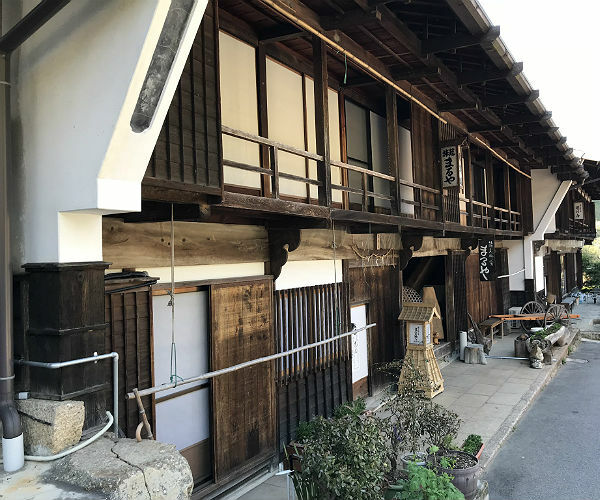 Their intention was to preserve its old Edo buildings and the Meiji Period unique character of the village, so there are no TV ariels, telephone pylons or electric cables. It looks just like it did hundreds of years ago. “Ring bell hard against bears” read the sign attached to the first bell post we came across. Without a bear to ring it against I gave the chain a long hard pull with the hope that the peels would scatter any bears on our path. The bells reminded me of the school dinner bell; I hoped it wasn’t the same for the bears. The bell posts were dotted every half a mile or so along the track as it passed through the pine forest above the gushing Araragi River. We thought singing along the way might add to the bells to frighten off the occasional bear, or at least Helene thought my tone deaf voice might. Coming out of the bear’s home we arrived at the river bank and an absolutely stunning view of cherry blossom in whites, pink and reds, some trees surprisingly displaying all three. 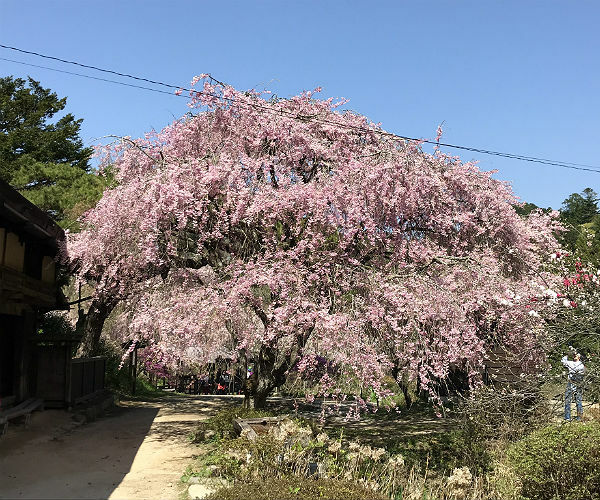 The scene was thick with colour and an ideal place to stop for our picnic of sushi, Sapporo beer and a small bottle of sake on a low table under the cherry blossom, what could be more Japanese? Wonderful. The trail took us through forests with a deep carpet of pine needles and along old cobbled paths hugging the river, it was a beautiful way to spend an afternoon with very few other walkers on the route. On arrival at Tsumago we were not disappointed, what an elegant and beautiful village it was, built in the stunning style of ancient Japan and thankfully not overly commercialised. Our stay that night was at the traditional Japanese boutique hotel Hanaya Ryokan, where we were to experience the best of Japan’s hospitality and its exacting etiquette. It’s the footwear that poses the biggest challenge. Shoes off and lots of mutual bowing on arrival, we were then provided with slippers and followed our host to our room where we were required to enter and remain barefoot, apart from the obligatory colourful toilet sandals, to be worn only inside the toilet. Leaving the smallest room with the sandals still on would be a definite faux pas. Our room had a low table with still lower and quite demanding chairs, the floor was covered in tatami mats and the walls seemed to be made of paper. But there was something missing, no bed. Our non-English speaking host must have registered my confusion as I peered into wardrobes, the bathroom and even the balcony, well you never know! ‘Futon, David,’ said Helene, who knows about these things. Our host mimed making a bed and not to touch the rolled up colourful duvet affair in another cupboard. We were then handed our own yukata’s, apparently. A dressing gown kimono type of affair that tied, importantly left side over the right (no idea why), with a huge double waistband around the middle, and fell to the floor, Helene looked terrific, I looked like I’d just got out of bed. We were now all prepared to tackle our first onsen bath, a long-standing tradition the Japanese are very proud of but which is riddled with ritual. 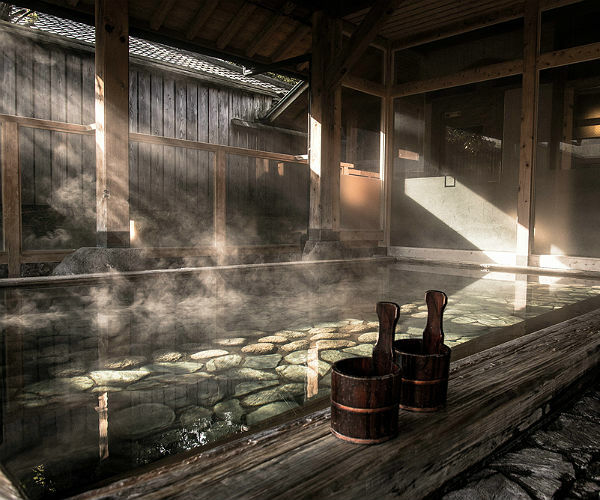 We needed to be careful here, onsen bathing is enjoyed naked. These hot cypress springs are both indoor and out and can be communal, fortunately our ryokan provided a segregated option so we set off in our colourful yukatas and a pair of open clogs to find a black flag for me and a red flag for Helene signifying the entry to our respective onsens. The changing room had a multilingual notice with instructions for use. 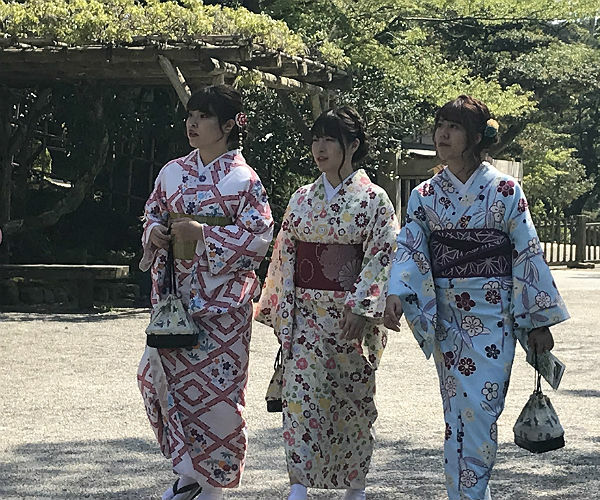 If you’re looking for another unique experience whilst in Japan check out this post on the Japan Art Islands. Now I’m as uninhibited as the next person, but it’s difficult to maintain your dignity swanning around an onsen with nothing more than an insubstantial flannel generously provided in the bamboo basket where you deposit your yukata. Where do you hold it, for a start? There seemed to be two schools of thought here, those who gaily flounced around with flannel flung brazenly over their shoulder and those who surreptitiously held it casually but carefully in front of them. Opting for the latter strategy I entered what at first looked like a cross between a beautician and a milking parlour. Three-legged low stools were lined up in front of large wall mirrors while a selection of soaps, oils and other unidentifiable cleansing potions were presented on another low table. Wash thoroughly before entering the onsen. Each mirror had a shower attachment next to it, one of those on a coil that is intended to be pulled out of the wall. I glanced at my fellow onsen users for a clue, trying desperately for my glance not to be confused with a stare. Sitting down close to the floor is an odd way to shower. Having eased my way down onto the low modesty stool I selected a couple of colourful liquids in Japanese bottles giving no indication which part of the body they specialised in and held the shower above me. I must say it was quite an enjoyable experience, I’m not convinced it will replace the more conventional alternative of standing up, but once I realised no one paid any attention to where all the hot steamy water was flying around it was fun. Enter the onsen slowly, it is hot. I made a quick dash to submerge myself in a vacant area of the open-air onsen. By heck it was hot. I watched the sun go down behind the blossom-laden hills in the distance as the hot oily water soothed my aching limbs from hiking the Nakasendo Trail. And I got it. What a wonderful way to spend an early evening, no wonder the Japanese are so proud of the tradition. Dinner was to be an equally traditional affair. 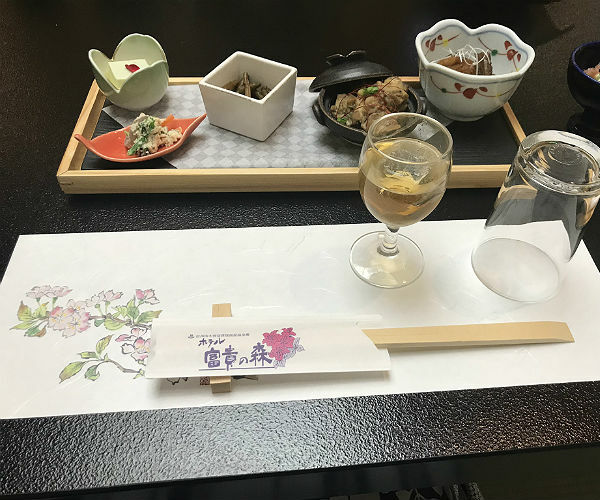 Dressed back in our yukata and the second set of slippers of the evening we were directed to our personal dining area in the partitioned restaurant and seated at a low table laid beautifully with small bowls and dishes, jugs of sake and glasses of a wonderfully sweet plum wine. The dishes kept coming from our waitress in her colourful kimono and the sake kept flowing as our miming of the ingredients became more extravagant and funnier. We collapsed into futons late in the evening for a wonderful nights sleep, what a glorious day. The new book by David ‘Turning Left Around the World’ is out now, published by Mirador and available on Amazon. This post contains affiliate links so if you click on them and make a purchase I will most likely get a commission. Just wanted to make sure you knew!